How many times have we gone to the store, or ordered online, then sat down to make our craft, only to realize that we forgot one very important thing? So we came up with two solutions that will hopefully help you, too. The first is a free resource that is a great companion to our book. The Forest Fairy Supply Checklist is a PDF file listing everything you need to make our crafts. You don't need all of these things at the same time, of course. A pocket-gnome can be made with felt, string, peg person, needle, and glue. 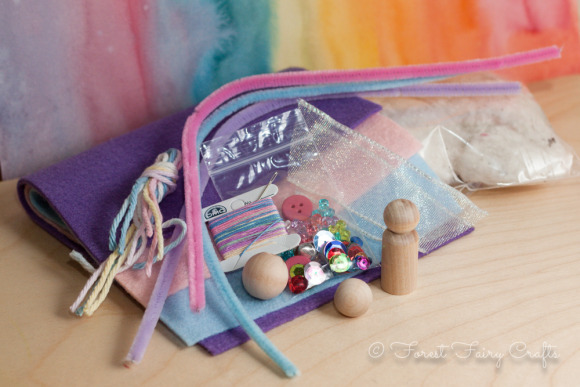 But if you want ideas, or wonder what to add to your Fairy Workshop Stash, this is a great place to start. In case you are giving the book as a gift, or you don't have a Fairy Workshop Stash (yet), we also put together starter kits that have everything you need to dive right into crafting in our Etsy shop. We were inspired to create these kits at a birthday party. "I love the book," said a friend, "But I don't have anything to make anything!" So we created the Forest Fairy Starter Kits. These kits have everything you need to make a fairy with a felt outfit, a child fairy, peg gnome, and critter. For now, they use craft-quality felt (good for play). We are working on versions with wool-blend felt and flower petals for fairy skirts. Since we love colors, we added a Halloween Kit and a Christmas Kit as well. We can see these being great companion gifts with our book. They do not come with any directions, but they would be perfect for any felt projects (inspired by our book or elsewhere). You could, of course, put together your own kits for favorite children in your life (using the checklist and your own supplies). Children love seeing all of the goodies collected together. We hope that these resources give you the tools and ideas to start making your own crafts!